On Friday night, Toronto’s Arraymusic paid tribute to composer James Tenney, an influential American composer who taught at York University in Toronto for many years. Tenney, who died in 2006, studied with such American composer greats as John Cage, Edgard Varese and Harry Partch. He wrote a wide range of experimental music, and was an important music theorist, accomplished pianist, and a conductor. His compositional output explored indeterminacy, computer-assisted composition, electronic music, algorhythmic composition and many other realms of music creation, all centered on a keen interest in sound and human perception. The incredible diversity of Tenney’s work was clear in Arraymusic’s programming. The concert began with Three New Seeds, written in 1991 for Array. This piece, composed of three short pieces were almost expressionistic in style, reminiscent of Anton Webern’s music in their brevity, melodic expression, and economy. This contrasted starkly with Harmonium #7 (2000), a work exploring intonation, composed for an indeterminate number of sustaining instruments. The piece slowly expanded from a single pitch, moving through various slow moving harmonic fields based on the harmonic series, and foregrounding differences in intonation between similar notes in different spectra. The shifts in harmony were very gradual and subtle, pleasantly transporting the listener through pitch space in a stretched temporal framework. Maximusic, one of Tenney’s brief ‘Postal’ pieces dating from 1965, was a text score for solo percussion. It asks the performer to begin the work with a very long cymbal roll crescendo, and end with a similarly long diminuendo on the tam-tam. In between, the performer is to improvise as loudly and quickly as possible on diverse percussion instruments chosen by the performer. It’s clear that Tenney was investigating human perception and the different modes of listening associated with these very different types of music. The resulting contrast is shocking. During the slow, long rolls, our listening is ‘zoomed in’ as we pay attention to every subtle sonic change, but the faster music aggressively forces us to ‘zoom out’. Rick Sacks performed the work with great care, bringing out amazingly rich subtleties of sound in the cymbal and tam-tam. Ergodos I (1963) has an open instrumentation and duration, and was dedicated to John Cage. It illustrates Tenney’s search for musical formlessness, or ‘ergodicity’. The composer here applied principles of statistics to small- and large-scale musical decisions, seeking a truly static musical form for the work. The two pre-recorded tapes can be combined in a number of ways, and ‘responded to’ (or not) by live instruments using a graphic score. In both the pre-recorded part and the percussion ‘responses’, the music exploited contrasts between pitched sounds and noise, and between long tones and faster constellations of sounds. Percussionists Rick Sacks and David Schotzko used diverse percussion instruments to create a fascinating interaction with the pre-recorded music, and effectively generated the contemplative, static musical environment that Tenney sought. Written in 1971 for solo double bass, Beast is another of Tenney’s ‘Postal’ pieces. The performer is directed to retune the lowest string of the double bass down to E-flat, and the piece begins with a unison between the instrument’s two lowest strings. The work explores the expansion of this interval through various glissandi slowly moving away from the unison, creating powerful beating between these low pitches that is not only heard but also physically felt. Through the regular repetition of these gestures, Toronto bassist Adam Scime seemed to make time stand still. Prelude and Toccata, for solo piano, was commissioned and premiered by Arraymusic’s Stephen Clarke in 2001. It employs a piano tuned according to the F harmonic series. The Prelude is a slow progression of crystalline sustained chords that gravitate around F, but that remain elusive in nature because of their high register. The following Toccata featured a rapid machine-like stream of notes reminiscent of Conlon Nancarrow’s Studies for Player Piano, works that Tenney wrote about extensively. Tenney emphasizes the piece’s F tonality within a complex harmonic world by sustaining only this pitch amid an onslaught of short notes. Unfortunately, in the middle of an excellent performance of this work, Clarke got a hand cramp that prevented him from completing the performance. The final piece on the program was Spectrum I (1995), written for the Array ensemble. Like John Cage’s late number pieces, the performers use a stopwatch, performing musical material somewhat freely within allotted time brackets. The music featured flowing melodic lines, at first slow and pensive, later more active and imitative, all the while delicately punctuated by subtle unpitched percussion sounds. The piece’s clear arch form is based on a slow increase then decrease in temporal density and dynamic level, and its pitches are based on a single harmonic spectrum. 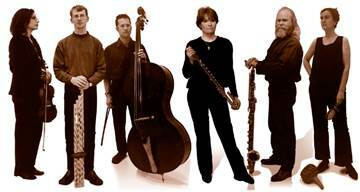 The Arraymusic ensemble gave excellent performances of all pieces presented; it is clear that the musicians have great respect for Tenney’s work. This is music that requires great care, subtlety and precision, and that is wide-ranging in its demands. The sonic environments created in Harmonium #7 and Spectrum I were especially magical. This varied concert demonstrated plainly Tenney’s diverse compositional interests. The great contrasts between works also allowed the audience to make connections between his music and that of other composers with similar interests (for me, Giacinto Scelsi, Gerard Grisey and Morton Feldman came to mind during the concert). While the composer employed many different theories and algorithmic techniques in his works, it was evident from attending this concert that the composer was interested most of all in the sounding of these ideas, and in our perception of them in performance. Tenney lived in Toronto for many years and spurred musical experimentalism in the city through his interaction with the community. After attending such a rich concert, one has to wonder why his thought-provoking music isn’t performed more often in this city. Sunday night’s Esprit concert had its ups and downs, but thankfully, there was more good than bad about it. The concert theme was a tribute to gamelan, a traditional music ensemble from the Indonesian islands. Esprit conductor Alex Pauk presented a work of his that had been re-tooled for orchestra Echo Spirit Isle (1983), as well as works by Canadian composers Chan Ka Nin, Andre Ristic, Claude Vivier, and Spanish composer Jose Evangelista. Despite the impressive line up, I found more than a few of the works on the programme wanting. The highlight of the night, surprisingly, was presented by traditional Balinese dancer Putu Evie Suyadnyani, who performed a complex and entrancing dance accompanied by a recording of the music. Wearing a traditional dancers outfit, the dance consisted of hundreds of subtle movements that made up a larger picture. Think of a painter, whose individual brushstrokes may not look like much, but when you step back, you can see the whole picture as it’s intended. Echo Spirit Isle suffered from the same problem as Chan Ka Nin’s Eveil aux oiseaux (2005) and Vivier’s Pulau Dewata (1977), which is that they dragged a bit in the middle. I actually liked Ka Nin’s piece most of all the pieces on this concert, but it still had some small issues. Pulau Dewata, originally intended for any combination of instruments that can fit the scoring, was arranged by composer Scott Good for this concert, and I must say, he did an impressive job. Using an orchestra to its full potential is a difficult thing for many composers, but Good managed to do that, with bright and interesting sounds, as well new textures and colours that kept everyone’s attention fixed on the stage. The title piece of the night, Jose Evangelista’s O Gamelan (2013) was a pleasant piece that made some interesting (and ultimately positive) choices in its use of the orchestra, however I found that there wasn’t too much going on below the surface. I still enjoyed it, so there’s that I suppose. American composer Lou Harrison’s Threnody for Carlos Chavez (1978), was a piece that I’d have to listen again in order to really come up with an opinion. I can say though, that the melodies that Harrison produced were quite lovely, and the often static background gamelan (provided by the Evergreen Contemporary Gamelan from Toronto) against the moving viola was a pleasure to listen to. It also wasn’t too long (a problem with many new works). So yes, I think I’d have to give it another listen before I cast my stone in one direction or the other. Overall, I enjoyed the concert. The Esprit musicians played the programme with their usual expert touch, and Esprit certainly reminded us again why it is a leader in the world of Canadian new music. Also, if you get the chance, do look up some Balinese dance on the internet. It really was spectacular.